Judy Garland (born Frances Ethel Gumm; June 10, 1922 – June 22, 1969) was an American singer, actress, dancer, and vaudevillian. During a career that spanned 45 years, she gained international stardom as an actress in both musical and dramatic roles, as a recording artist, and on the concert stage. Respected for her versatility, she received a juvenile Academy Award, a Golden Globe Award, and a Special Tony Award. 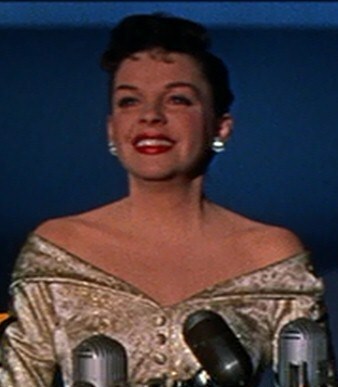 Garland was the first woman to win the Grammy Award for Album of the Year for her live recording Judy at Carnegie Hall (1961). 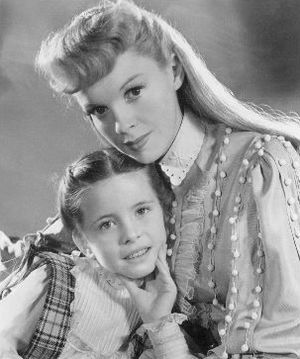 As a child, Garland began performing in vaudeville with her two older sisters, and later signed with Metro-Goldwyn-Mayer as a teenager. She made more than two dozen films with MGM and is known for playing Dorothy Gale in The Wizard of Oz (1939). Garland was a frequent on-screen partner of both Mickey Rooney and Gene Kelly, and regularly worked with director and husband Vincente Minnelli. Other film roles with MGM include appearances in Meet Me in St. Louis (1944), The Harvey Girls (1946), Easter Parade (1948), (with Fred Astaire) and Summer Stock (1950). 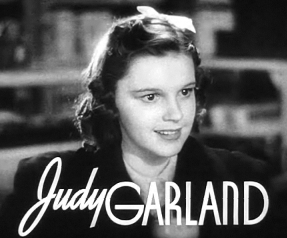 Garland was released from MGM in 1950, after 15 years with the studio, amid a series of personal struggles that prevented her from fulfilling the terms of her contract. Her film appearances diminished, but she would go on to receive two Academy Award nominations for her performances in A Star Is Born (1954) and Judgment at Nuremberg (1961). She also made record-breaking concert appearances, released eight studio albums, and hosted her own Emmy-nominated television series, The Judy Garland Show (1963–1964). At age 39, Garland became the youngest and first female recipient of the Cecil B. DeMille Award for lifetime achievement in the film industry. In 1997, Garland was posthumously awarded a Grammy Lifetime Achievement Award. Several of her recordings have been inducted into the Grammy Hall of Fame, and in 1999, the American Film Institute placed her among the 10 greatest female stars of classic American cinema. 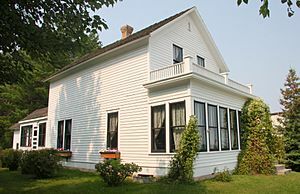 Garland was born Frances Ethel Gumm in Grand Rapids, Minnesota. She was the youngest child. Her parents were vaudevillians who settled in Grand Rapids to run a movie theater that featured vaudeville acts. She was of Irish, English, and Scottish ancestry, named after both of her parents and baptized at a local Episcopal church. The family relocated to Lancaster, California, in June 1926. Frank purchased and operated another theater in Lancaster, and Ethel began managing her daughters and working to get them into motion pictures. Garland attended Hollywood High School and later graduated from University High School. In 1928, the Gumm Sisters enrolled in a dance school run by Ethel Meglin, proprietress of the Meglin Kiddies dance troupe. They appeared with the troupe at its annual Christmas show. Through the Meglin Kiddies, they made their film debut in 1929, where they performed a song-and-dance number. This was followed by appearances in two Vitaphone shorts the following year. They next appeared together in Bubbles. Their final on-screen appearance came in 1935, in an MGM Technicolor short entitled La Fiesta de Santa Barbara. The trio had been touring the vaudeville circuit as "The Gumm Sisters" for many years when they performed in Chicago at the Oriental Theater with George Jessel in 1934. He encouraged the group to choose a more appealing name after "Gumm" was met with laughter from the audience. According to theater legend, their act was once erroneously billed at a Chicago theater as "The Glum Sisters". 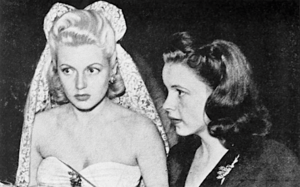 Several stories remain regarding the origin of the name "Garland", but Garland's daughter Lorna Luft stated that her mother selected the name when it was announced that the trio "looked prettier than a garland of flowers". By late 1934, the Gumm Sisters had changed their name to the Garland Sisters. Frances changed her name to "Judy" soon after. The group broke up by August 1935, when Suzanne Garland flew to Reno, Nevada, and married musician Lee Kahn. In September 1935, Louis B. Mayer asked songwriter Burton Lane to go to the Orpheum Theater in downtown Los Angeles to watch the Garland Sisters' vaudeville act and to report to him. 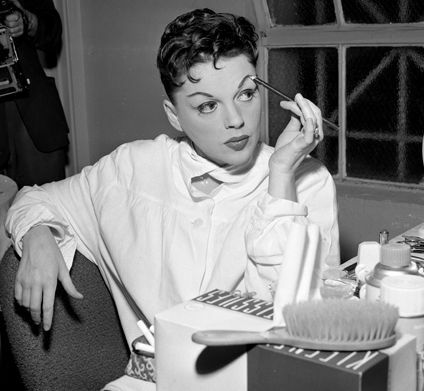 A few days later, Judy and her father were brought for an audition at Metro-Goldwyn-Mayer Studios in Culver City. Garland performed "Zing! Went the Strings of My Heart" and "Eli, Eli", a Yiddish song written in 1896 and very popular in vaudeville. They immediately signed Garland to a contract with MGM, presumably without a screen test, though she had made a test for the studio several months earlier. The studio did not know what to do with her, as at age thirteen, she was older than the traditional child star, but too young for adult roles. Despite great professional success, Garland struggled in her personal life from an early age. The pressures of adolescent stardom affected her physical and mental health from the time she was a teenager; her self-image was influenced and constantly criticized by film executives who believed that she was physically unattractive. Those same executives manipulated her onscreen physical appearance. Her physical appearance was a dilemma for MGM. She was only 4 feet 11.5 inches (151.1 cm), and her "cute" or "girl-next-door" looks did not represent the most glamorous persons required of leading ladies of the time. She was self-conscious and anxious about her appearance. Judy went to school at Metro with Ava Gardner, Lana Turner, Elizabeth Taylor, even though Judy was the big money-maker at the time and a big success, she was the ugly duckling. Her insecurity was worsened by the attitude of studio chief Louis B. Mayer, who referred to her as his "little hunchback". MGM hit on a winning formula when it paired Garland with Mickey Rooney in a string of what were known as "backyard musicals". The duo first appeared together as supporting characters in the 1937 B movie Thoroughbreds Don't Cry. 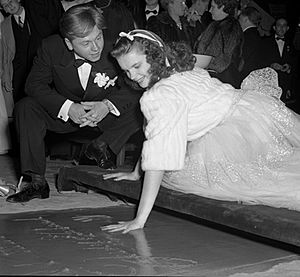 Garland was then put in the cast of the fourth of the Hardy Family movies as a literal girl-next-door to Rooney's character Andy Hardy, in Love Finds Andy Hardy, although Hardy's love interest was played by Lana Turner. They teamed as lead characters for the first time in Babes in Arms, ultimately appearing in five additional films, including Hardy films Andy Hardy Meets Debutante and Life Begins for Andy Hardy. Garland's weight was within a healthy range, but the studio demanded she diet constantly. They even went so far as to serve her only a bowl of soup and a plate of lettuce when she ordered a regular meal. She was plagued with self-doubt throughout her life, despite successful film and recording careers, awards, critical praise, and her ability to fill concert halls worldwide, and she required constant reassurance she was talented and attractive. In 1938, she was cast in her most memorable role, as the young Dorothy Gale in The Wizard of Oz (1939), a film based on the 1900 children's book by L. Frank Baum. 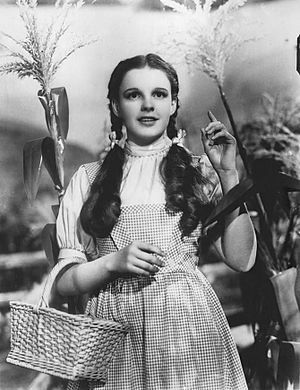 In this film, she sang the song with which she would be identified, "Over the Rainbow". Although producers Arthur Freed and Mervyn LeRoy had wanted her from the start, studio chief Mayer first tried to borrow Shirley Temple from 20th Century Fox, but they declined. Deanna Durbin was then asked, but was unavailable, resulting in Garland being cast. Garland was initially outfitted in a blonde wig for the part, but Freed and LeRoy decided against it shortly into filming. Her blue gingham dress was chosen for its blurring effect on her figure, which made her look younger. 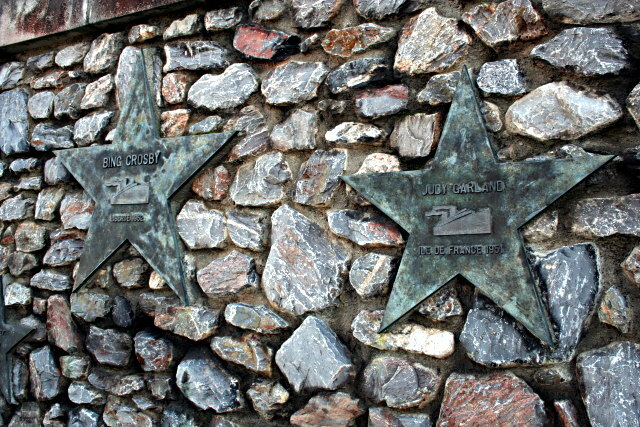 Shooting commenced on October 13, 1938, and was completed on March 16, 1939, with a final cost of more than US$2 million. With the conclusion of filming, MGM kept Garland busy with promotional tours and the shooting of Babes in Arms, directed by Busby Berkeley. She and Rooney were sent on a cross-country promotional tour, culminating in the August 17 New York City premiere at the Capitol Theater, which included a five-show-a-day appearance schedule for the two stars. Garland was forced into a strict diet during filming; she was given tobacco to suppress her appetite. The Wizard of Oz was a tremendous critical success, though its high budget and promotions costs of an estimated $4 million (equivalent to $61.4 million in 2019), coupled with the lower revenue generated by discounted children's tickets, meant that the film did not make a profit until it was re-released in the 1940s and in subsequent re-releases. At the 1939 Academy Awards ceremony, Garland received her only academy award, a Juvenile Award for her performances in 1939, including The Wizard of Oz and Babes in Arms. On June 22, 1969 Garland died in her house in Cadogan Lane, Belgravia, London; she was 47 years old. At the inquest, Coroner Gavin Thurston stated that the cause of death was "an incautious self-overdosage" of barbiturates. Thurston stressed that the overdose had been unintentional and that no evidence suggested she had committed suicide. Her death certificate stated that her death had been accidental. Her remains were taken to New York City on June 26, where an estimated 20,000 people lined up to pay their respects at the Frank E. Campbell Funeral Chapel in Manhattan, which remained open all night long to accommodate the overflow crowd. On June 27, James Mason gave a eulogy at the funeral, an Episcopal service. "Judy's great gift," Mason said in his eulogy, "was that she could wring tears out of hearts of rock." - "She gave so richly and so generously, that there was no currency in which to repay her." The public and press were barred. She was interred in a crypt in the community mausoleum at Ferncliff Cemetery in Hartsdale, New York, a small town 24 miles (39 km) north of midtown Manhattan. 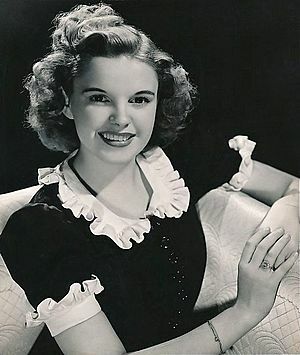 The remaining business assets of Garland; inclusive of rights to her albums, television specials and her television series The Judy Garland Show, along with the rights to her name and image are managed by her son Joe Luft who runs 'Royal Rainbow Productions LLC' - the company which oversees the affairs pertaining to the estate of Judy Garland. In 1978, a selection of Garland’s personal items were auctioned off by her ex-husband Sid Luft with the support of her daughter Lorna and son Joe. Almost 500 items, ranging from copper cookware to musical arrangements, were offered for sale. The auction raised US$250,000 for her heirs (US$992,447.67 in 2018). By the time of her death in 1969, Garland had appeared in more than 35 films. 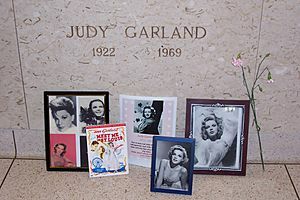 She has been called one of the greats of entertainment, and her reputation has endured, Garland was probably the greatest American entertainer of the twentieth century. No one in the history of Hollywood ever packed the musical wallop that Garland did, she had the biggest, most versatile voice in movies. The songs she introduced were Oscar gold. Her film career frames the Golden Age of Hollywood musicals. Turner Classic Movies dubbed Garland "history's most poignant voice". Entertainment Weekly's Gene Lyons dubbed Garland "the Madonna of her generation". The American Film Institute named her eighth among the Greatest female stars of Golden Age Hollywood cinema. In June 1998, The New York Times wrote that, "Garland was a personality on the grand scale who makes our current crop of pop stars look lightweight." In recent years, Garland's legacy has maintained fans of all different ages, both younger and older. In 2012 it she was described as "more than an icon... Like Charlie Chaplin and Lucille Ball, she created a template that the powers that be have forever been trying, with varied levels of success, to replicate." Garland's live performances towards the end of her career are still remembered by fans who attended them as "peak moments in 20th-century music". Garland has been the subject of over two dozen biographies since her death, including the well-received Me and My Shadows: A Family Memoir by her daughter, Lorna Luft, whose memoir was later adapted into the television miniseries Life with Judy Garland: Me and My Shadows, which won Emmy Awards for the two actresses portraying her. Garland was posthumously awarded the Grammy Lifetime Achievement Award in 1997. Several of her recordings have been inducted into the Grammy Hall of Fame. These include "Over the Rainbow", which was ranked as the number one movie song of all time in the American Film Institute's "100 Years...100 Songs" list. She has twice been honored on U.S. postage stamps, in 1989 (as Dorothy) and again in 2006 (as Vicki Lester from A Star Is Born). Judy Garland Facts for Kids. Kiddle Encyclopedia.